About those contracts . . .
#5 About those “contracts” . . .
People often tell me about how their “friend” once saw a chiropractor who tried to make them sign a contract promising they would come in 72 times over the course of a year and that they would have to pay for these visits whether they came in or not. When I hear this, I immediately have a vision of the movie The Godfather when Michael tells the story of Vito Corleone assuring the bandleader that either his signature or his brains would end up on that contract. Here’s the deal on these “contracts”. In almost every case, the chiropractor who uses these contracts is trying to PROTECT the patient. What they are actually doing is explaining to the patient – in writing – how many visits they think it will take to fix their problem, and exactly how much it is going to cost them. They are letting the patient know IN ADVANCE what their responsibility is going to be if their insurance isn’t going to pay for the whole course of treatment (which is getting more and more common in these days of high deductible, high co-pay Obamacare). This way, there is no confusion. I’ll bet there have been times when you’ve gone to the doctor and thought your insurance was going to cover everything, then got a big bill from the doctor six months later. It’s happened to me and I sure don’t like it, I doubt you do either. So when the doctor puts the treatment plan and costs in writing, he’s actually protecting the patient by showing them that there won’t be any nasty (and expensive) surprises later. Now I’ll admit that there are a few (very few I hope) chiropractors, medical doctors, dentists and others healthcare professionals that may try to use these contracts to intimidate people into coming in for care they don’t want because they applied hard sell techniques and scare tactics when the patient was desperate for relief and got the patient to sign a “contract”. Well, let me let you in on a little secret, you can’t be made to pay for treatment you didn’t receive no matter what type of piece of paper a doctor makes you sign. They also can’t legally promise you a discount then threaten to charge you full price if you stop your treatment early. Unfortunately, there are good and bad in every profession – good chiropractors and bad chiropractors, good medical doctors and bad medical doctors, good teachers and bad teachers, good firemen and bad firemen and so on… I consider myself a good chiropractor because I always explain my patient’s financial responsibilities (co-pays, deductibles, non-covered charges, if there are any) before performing treatment and give them the choice of whether or not they want those services and how they would like to pay for them if they need to pay for some out of pocket. Chiropractic is a wonderful healing art that can often produce amazing results, even when other doctors have failed to help. 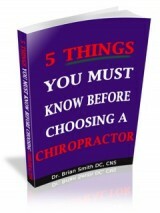 I hope this guide has helped clear up any confusion you may have had, and alleviated any fear you may have experienced when deciding on whether or not you should see a chiropractor. Whether you try to find one in your insurance book or whether you get a recommendation from a friend, odds are there is a chiropractor out there (probably more than one) that can help you. However, you won’t get any help unless you take action. Pick up the phone and call a chiropractor and get started on the road to pain relief and better health. I’m sure you’ll be glad you did.If you would like a copy of the eBook this post comes from, just email me at drsmith@southernoceanchiro.com and I will send you a pdf copy.